Diverging somewhat from our normal posts is a post about a new visualization developed in our group. Sequence logo with entropy encoding. 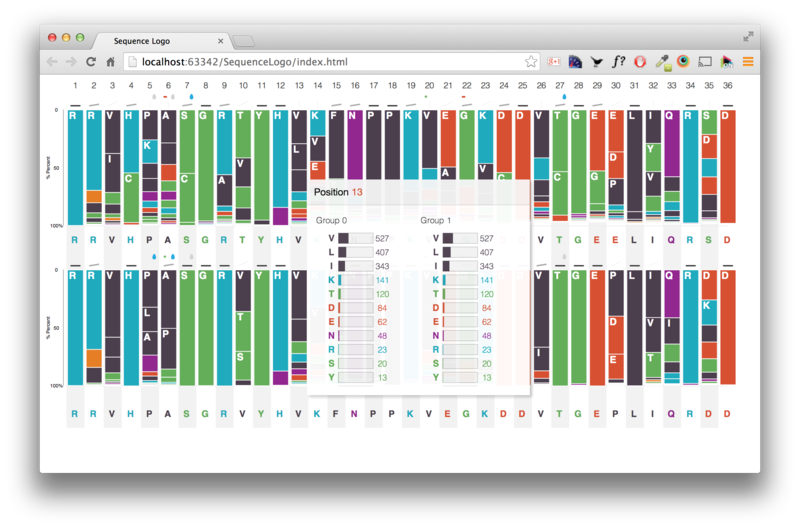 Sequence logo with frequency based encoding and showing detail on demand view on position hover. Everything, as always, is open source and available with examples on our GitHub repository https://github.com/ISA-tools/SequenceLogoVis. Let us know what you think, what should be improved, etc. via our issue tracker. The paper is available here and the presentation will be online soon! In this varied, interesting and challenging role the successful candidate will provide technical knowledge, software engineering and leadership ability for(i) the ELIXIR UK node of the ELIXIR programme, and (ii) a growing portfolio of data and knowledge management projects. Interviews will held shortly after the closing date. enhancement of relevant components of the ISA software suite (http://isacommons.org) and of the BioSharing registry (http://biosharing.org), embedded into a large number of UK and EU funded projects. other service providers, members of pre-competitive informatics initiatives and developers of data publication platforms journals.The Life, Natural and Biomedical Sciences team of the University of Oxford e-Research Centre works to develop software and promote the creation and uptake of community-developed ontology, standards and curation best practices, and their pivotal role in enabling reproducible research, driving science and discoveries (http://oerc.ox.ac.uk/collaborations/biological-and-medical-science). The Life, Natural and Biomedical Sciences team of the University of Oxford e-Research Centre works to develop software and promote the creation and uptake of community-developed ontology, standards and curation best practices, and their pivotal role in enabling reproducible research, driving science and discoveries (http://oerc.ox.ac.uk/collaborations/biological-and-medical-science). Have some competence with design packages such as Adobe Photoshop or Illustrator. As well as technical and design ability, it is essential that the individual is able to effectively communicate ideas and concepts between different groups. The successful candidate must be able to demonstrate the ability to work well with colleagues and to collaborate with external partners, including other developers. The successful candidate must have excellent communication and interpersonal skills and enjoy working in a stimulating and international culture. A while ago, we went along to the ORCID codefest at St. Anne’s College, Oxford. In the day or two of coding, Alejandra won with her entry in adding ORCID functionalities to ISAcreator. 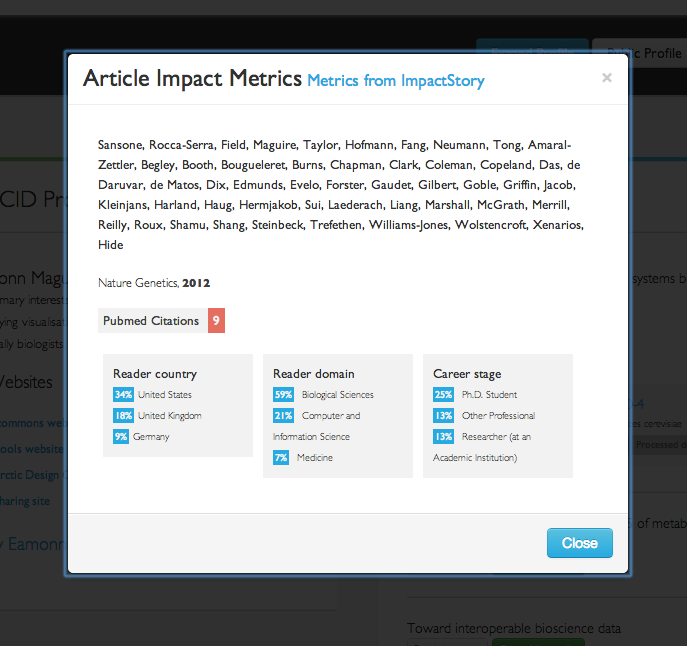 In my entry, I created a system that presented article impact metrics from ImpactStory and also automatically pulled ArrayExpress and PRIDE data links for publications. The advantages being that users don’t have to go looking for the data for a publication across many repositories. Take this example from ArrayExpress, E-GEOD-31453 – from the submission, you’d never know that there were other data submissions directly related to this submission in ArrayExpress or elsewhere, e.g. E-GEOD-27713. The component developed for BioSharing, but could be used by anyone takes a PubMed ID or DOI and finds the data available in public repositories relating to that publication. It’s use is illustrated in one of the profiles for one of our latest BioSharing users, Sheng-Da Hsu. You can see a screenshot of his publications section below, or see it for yourself here. In true Star Wars fashion, we are bringing you the prequel to the last blog post discussing how to set up data file access from your JBoss installation. In this post we’ll discuss how to set up the BioInvestigation web application, from build to deployment. First, you’ll need to have a Java installed. Then you’ll need to download Maven, this is what automates the build process for the BII web application. 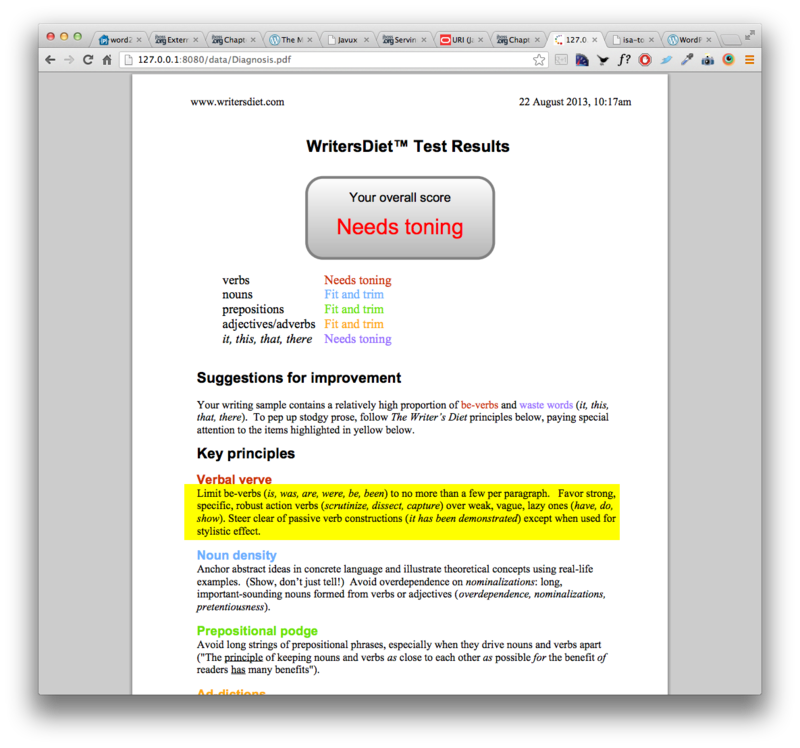 A bit like Ant, but it adds dependency management, meaning no need for pesky lib directories. Why this version I hear you ask? Well for some silly reason, the Maven developers (as great as they are) thought that removing the ability to specify profiles in profiles.xml was a great idea. We don’t think it is. In Maven 3+ you can only specify profiles in the pom.xml file or in the settings.xml file under the .m2 directory on your system. So, use version 2.2.1. We’ll move on to configuring these profiles a little later. 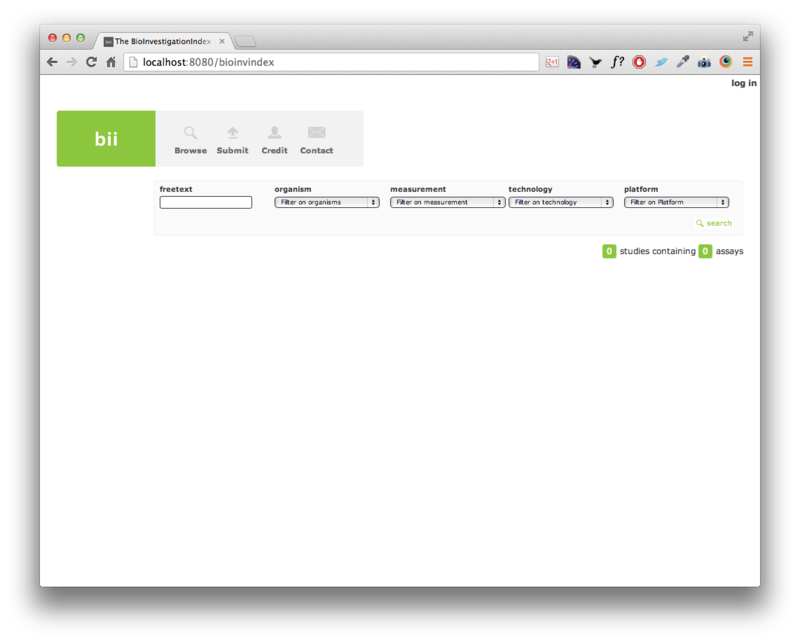 Now you need Git which we’ll use to get the latest BII codebase from GitHub. If you haven’t heard of Git, you simply haven’t lived. Get out from underneath that SVN rock and join the Git revolution. It’s worth migrating just for the benefit of GitHub or some other funky equivalent (BitBucket or Launchpad). Next, download JBoss 5.1.0 from http://sourceforge.net/projects/jboss/files/JBoss/JBoss-5.1.0.GA and move the JBoss directory to somewhere to your liking. For further examples, let’s say that’s /etc/jboss-5.1.0.GA/ for the rest of this post. Finally, if you want to deploy properly, you’ll need a database. The BII works with Oracle, Postgres, MySQL or MariaDB. You can also run the application just for using the H2 database (we use this for testing). If your database of choice (apart from H2), you’ll need to create a database (we usually name it bioinvindex) and a user (it’s always a good idea to not just use root as the user) and grant that user all permissions to the database. With everything in place, you need to ‘clone’ the BioInvIndex repository from GitHub. So navigate to a directory of your choosing, and via the command line type ‘git clone https://github.com/ISA-tools/BioInvIndex.git&#8217;. This will create a BioInvIndex directory for you with all the code inside. I mentioned earlier about Maven and profiles. In the bioinvindex directory just created for you, you’ll see a profiles.xml file. Not to get too bogged down on details about what these profiles are for, I’ll give a brief explanation. The main pom.xml file (Project Object Model) for maven defines a number of dependencies, or libraries that are required for the application to run. Some of these dependencies are not always known in advance. For example, if I am running an application on MariaDB, why would I want to have Oracle and Postgres libraries in the final EAR (Enterprise Archive, the JBoss answer to WAR files in Tomcat)? The Profiles just allow us to automatically inject some properties in to the pom file on build depending on what the person building it wants to run. Some of these profiles also go towards creating the hibernate.properties file required by hibernate for connection to the database or in specifying to the application the whereabouts of the Lucene index (will talk more about that in a bit). So now, given you have some context, open profiles.xml up and you’ll find a number of individual ‘profile’ elements for the various database installations and a few for the Lucene index locations. First, find the profile matching your database and edit the username and password, database name (if not bioinvindex), URL and any version information, etc. Then, modify the index profiles (named index_local and index_deploy) that specify where the Lucene index for the BII web app will reside. The Lucene index is used to speed up the web application, massively reducing the number of database queries that are required. The majority of the web application front end is based on the contents of the Lucene index. Make sure that the application has read/write access to that location. Finally, we want to actually run our application. The next step will rely solely on JBoss. navigate to /etc/jboss-5.1.0.GA/bin/ and you’ll see a number of scripts. The only one you need worry about is run.sh – to run JBoss using the default server (that’s where we copied the ear to), execute the following command – ./run.sh -c default -b 0.0.0.0 & the last bit will bind the server to address 0.0.0.0, so it’ll be visible to the outside world and will run on port 8080 by default. You can change the port by following the guidance in this Stackoverflow post. Hopefully everything will start running, and the bii ear will be deployed and you’ll be able to see it at http://localhost:8080/bioinvindex. You will see errors in the startup log, but that’s because nothing exists in our database yet…there are no tables present at this point. We’ll create the database next. For this, you’ll need the BII Manager. You can download this from http://isatab.sourceforge.net/tools.html. The latest version (1.6.1) is available here. Firstly, the database connection information. Open up the hibernate.properties file under the config/ directory and copy in the same username, password, database URL, index location, etc. as you entered in the profiles.xml for the BII web application. Next, you may want to set up data-locations.xml. Data locations tell the manager tool where to copy data files and ISA-Tab files as well as the URL the web application will be able to access them from. More information on the set up of JBoss to point to these data directories is available in a previous blog post. Now, we’re ready to go. If you are using MySQL, H2, MariaDB or Postgres, you’ll be able to run the application by just double clicking isa_deps.jar or executing ./run.sh from the command line. If you are using Oracle, you will need to add the Oracle driver on the classpath. Edit the run.sh file to do this then when ready, from the command line, run ./run.sh. When the application starts, you’ll be presented with a log in screen. At this point, create a curator account. When this is done for the first time and the database has no schema available, the application will automatically create the schema via Hibernate (a fantastic tool). So you’ve nothing to do. Then, when that’s completed successfully (if it doesn’t check your hibernate.properties entries), you’ll be able to log in and load content. This will stop the checking of the schema every time a connection is opened. That’s it! Let us know if we missed anything, and we’ll update this post. I was wondering how to make the web app public? Instead of being visible just on my local machine? We have been getting asked a lot about general deployment within the ISA tools suite, particularly with respect to the web application, which can look a little complex. Here I’m going to describe one of the more perplexing tasks when setting up JBoss: how do I configure JBoss to serve up static content, i.e. my data files. I will also cover how to set up the URLs in data-locations.xml (for the BII Manager tool) to automatically place your files in this directory. Probably the most annoying part of setting up JBoss is telling JBoss to serve out your data files from the web application. For instance, the BII data manager tool has sent the files to /tmp/data/bii/ on my file system and I want the URL http://localhost/data to point to that directory. There are a number of ways you can do this. You can use Apache or nginx to do this, you could change your data directory to be within the ROOT.war directory in your JBoss server directory, or you could do what I’m suggesting here and do everything through JBoss…which I think is a bit cleaner, and not so difficult when you know how. 1. The first thing to do is modify the profile.xml file found under the server/default/config/bootstrap folder in your JBoss installation. In profile.xml, there is a bean named BootstrapProfileFactory, you need to modify this and add a value element to the java.net.URI list element. Here, I’ve added a path to my Downloads directory. 2. Next, we need to set up a folder in my Downloads directory, which has to have a series of folders following the deploy pattern of /server/<profile>/deploy/ – so now, the directory /Users/eamonnmaguire/Downloads/server/default/deploy/ should exist. 3. Within the deploy directory, create a data.war directory, and inside that create a WEB-INF directory. The name of the .war directory will dictate the URL, so data.war will correspond to http://localhost/data. In the WEB-INF directory, create an empty web.xml file. It’s contents will be <web-app></web-app> – Under the /Users/eamonnmaguire/Downloads/server/ I now have the following directory structure. 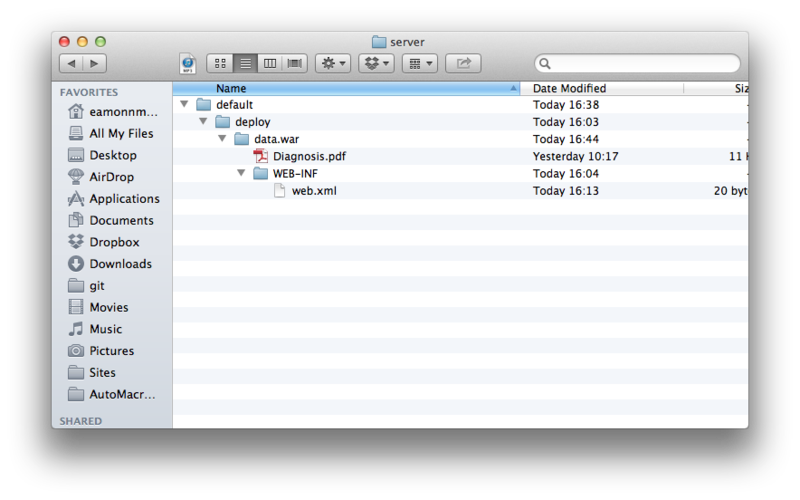 Finally, within your data.war directory, add the files you want to display. Here I’ve added a PDF for simplicity. Start up JBoss running ./run.sh -c default and navigate your browser to http://localhost:8080/data/Diagnosis.pdf and I get this lovely page. Now, to configure data-locations.xml. For out ISA-Tab for example, we simply set up the filesystem_path to be where, on our machine we want the files to be distributed. The web_url will be the URL we’ve just configured that has mapped data to that actual position in the file system. How do you do this all on a Linux system? It’s much the same as on mac. The only thing that’s different is the file path. okay, so could you possibly give an example? It’s essentially just a case of modifying the paths in this example. Linux and Mac are essentially the same under the hood. Thanks, I tried, but it didn’t work. I tried putting a test.pdf file into /home/cserhati/data/server/default/deploy/data.war/ but I cannot see it. Is this the place, by the way, where I have to put all my isatab files? Which version of JBoss are you using? A few people have followed this guide now and it works. The ISATab files are placed in these directories automatically by the loader – the last step in the above post shows a fragment of the data-locations.xml file that resides in the BII Data Manager config directory – you edit that file to tell it where your data.war directory is. There is an alternative, which is straightforward if you use Apache for load balancing etc. in that you can use apache to handle the files, or something more suited to media such as nginx. Alejandra’s project, adding ORCID support in to ISAcreator has won the ORCID codefest prize. Alejandra will be going to CERN in October to participate in the ODIN codefest! Search for an ORCID record via a dedicated interface. User information automatically added from ORCID. It’s been a while since we’ve updated you all. Yesterday and today, Alejandra and I participated in the ORCID codefest. ORCID, for those of you who don’t know about it, sets out to create a unique ID for every researcher. Gone will be the days of trying to find your articles online to list it on your web page! 2. Use ORCID information to automatically fill out user profile information in ISAcreator – this won, and Alejandra will be going to CERN in October for the ODIN codefest! 1 and 2 were implemented in the last day. So, here’s a breakdown of what we did. 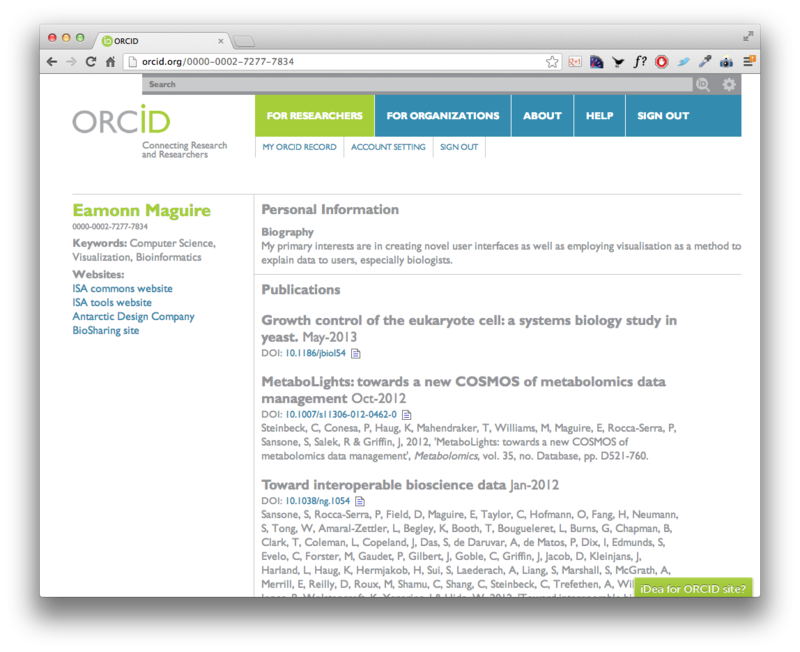 User profiles populated from ORCID information in BioSharing. 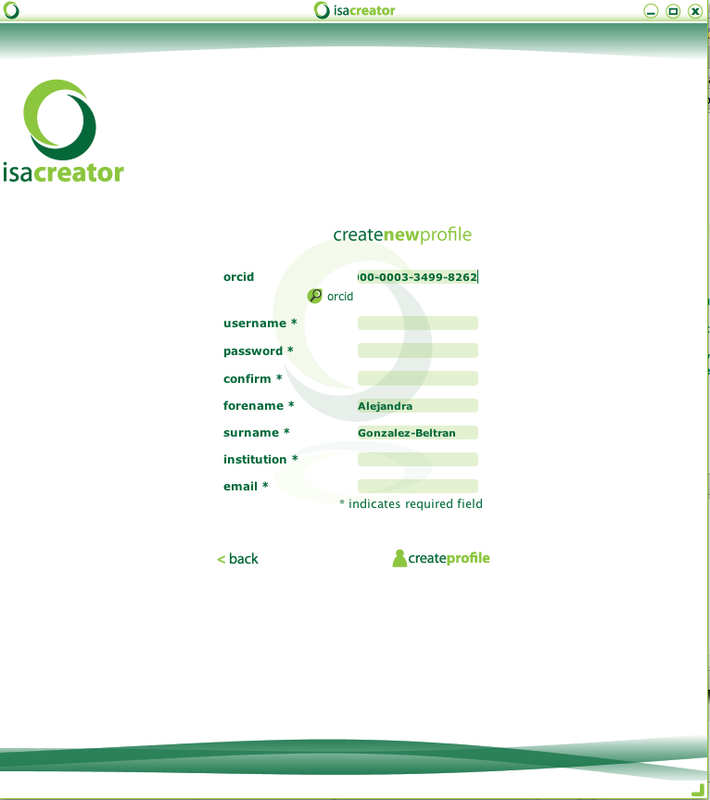 In the above image, we are showing my user profile in BioSharing. 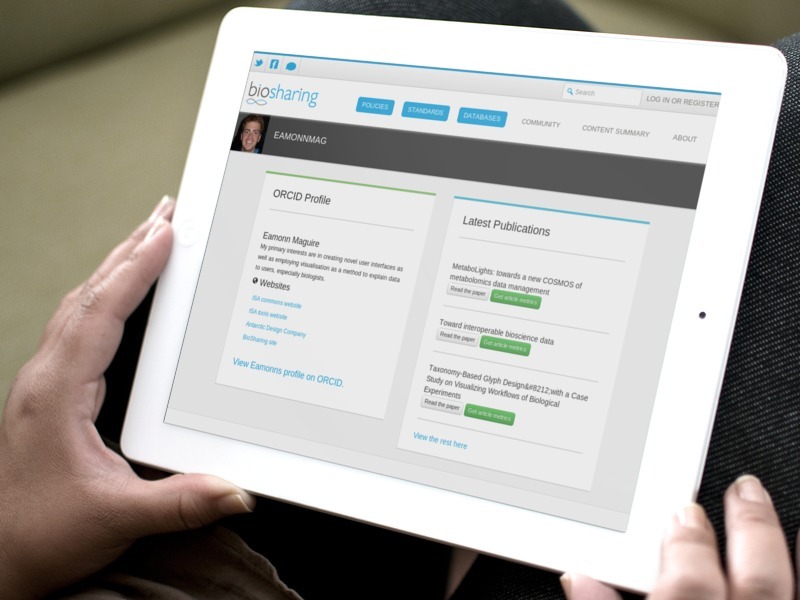 Any user can have a profile, and can import their ORCID profile by simply entering their ID. In addition to this, BioSharing profiles also include information about the standards, policies and biodbcore records maintained by the user. Publication information, with inferred data links and links out to article metrics – shown below. Aside from just showing the information from ORCID, we also do something which we think is really useful…automated retrieval of data records in public repositories for each publication. At the minute, we search on ArrayExpress, but can extend this to PRIDE, Metabolights and others soon. Impact story for an article is made available through the BioSharing interface. So what’s next? Well we’ll push these changes to the main BioSharing page pretty soon, once everything has undergone considerable testing! 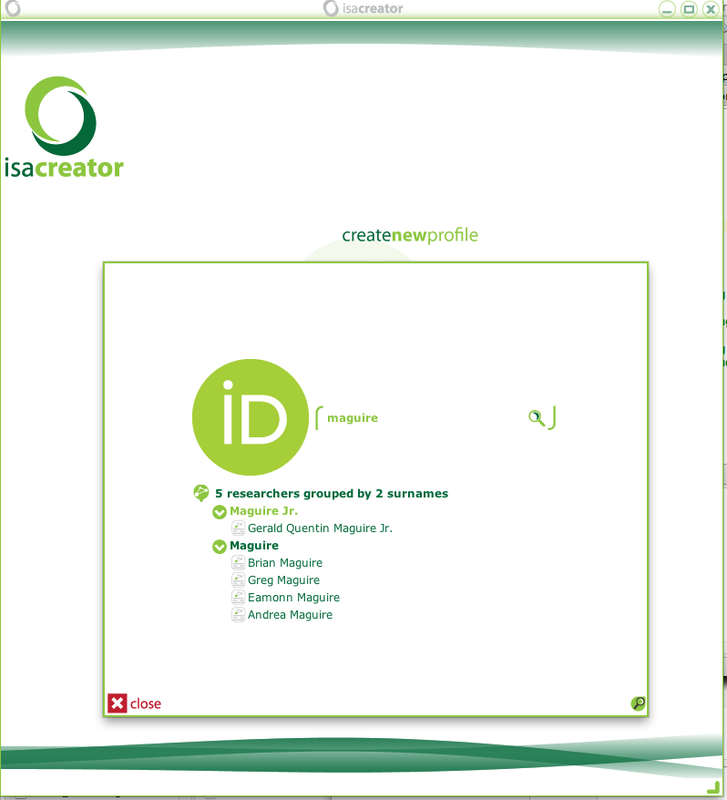 Alejandra has been working on using ORCID to populate user profiles automatically when creating ISAcreator user profiles. Users can also search ORCID through an interface shown below if they do not know their ORCID. We’ll be extending this, improving it and integrating it as a service for looking up contacts in ISAcreator too (point 3). Many thanks to the organisers for a great meeting! We really enjoyed this! A new paper, featuring the ISA team as authors is now available to read on MetaboLights (EMBL-EBI metabolomics repository). 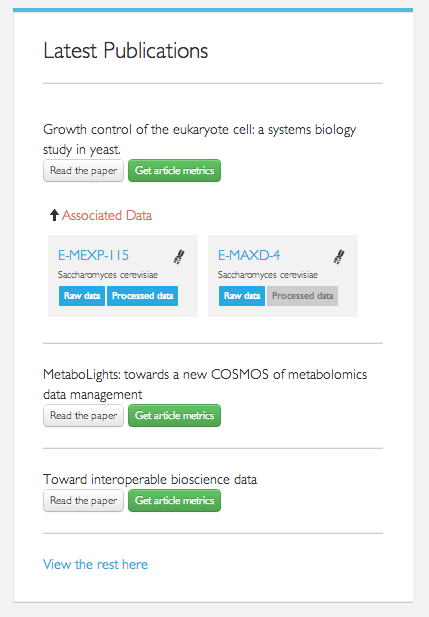 MetaboLights, part of the ISA commons is the new European repository for metabolomic data held at the EBI. Their infrastructure is built upon the ISA software stack, utilising ISAcreator for data entry, ISA-Tab as the format then the BII data manager and database for persistence and storage respectively. Click here to access the MetaboLights repository. Since Mountain Lion came out, we’ve had some users unable to run ISA tools. The reason why is down to Apple’s change in security policies. Apple now try to restrict the applications run by default on Mac OS to those downloaded from the app store. 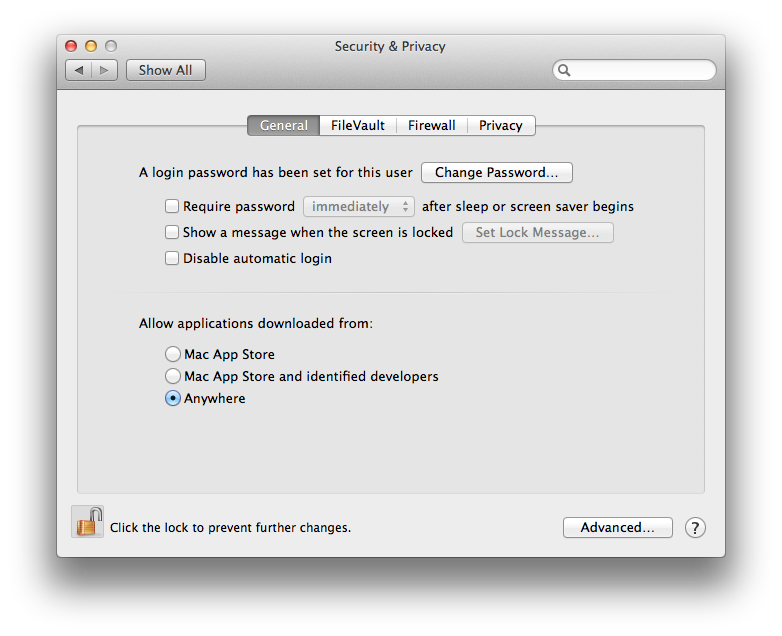 To change this, you need to access your security preferences. You can access this quickly through spotlight as shown below. You will then be faced with the security and privacy window and will see a section named “Allow applications downloaded from”. You need to change this from Mac App Store to Anywhere. If you are unable to change it, you first need to click on the lock icon to change it. In the end, your Security and Privacy screen should look like this. Eamonn won the digital research 2012 developer challenge last night in an event held at the Oxford e-Research Center. His mobile app, called BioEye, of which a prototype was built in 1 day during the event helps in disseminating better the knowledge about biodiversity in our local environments. The app and idea won in a field of 6 other competitors. Further information about this app will come soon.